"Hi, I want to know how can I delete an iCloud backup and what happens when I delete iCloud backup? Can anyone help me please?" 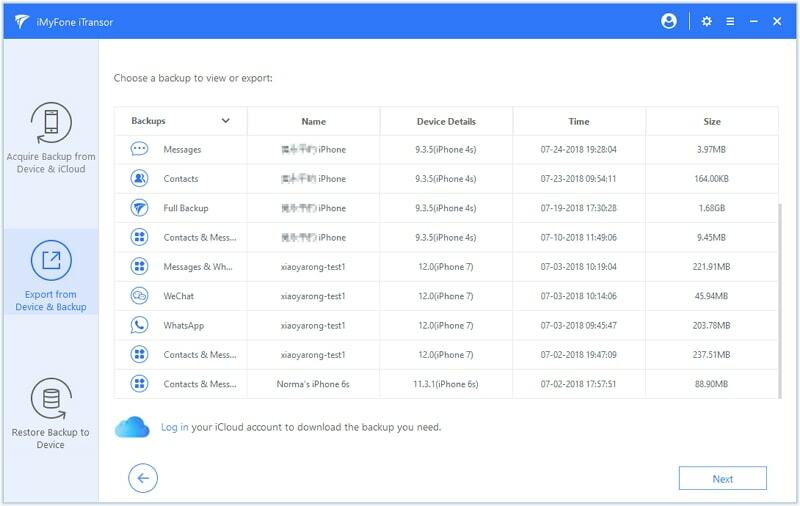 No matter what is the reason behind the decision of iCloud backup deletion, for example, you wish to clear up storage space or you no longer need the backup, before you move on to delete, we would like you to know what will happen if you delete your iCloud backup. We will also provide you some important information on how to manage your iCloud backup better. Open 'Settings' and tap on your name or Apple ID. 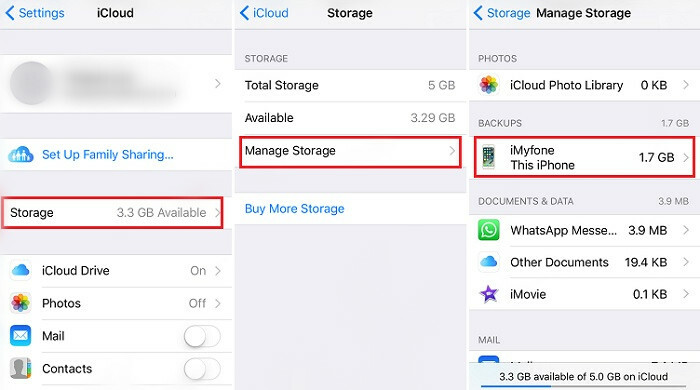 Now, hit on 'iCloud' and head to 'Manage Storage'. Tap 'Backup' followed by the device's name you no longer need backup of. Finally, hit on 'Delete Backup' and you're done. Pick out 'System Preferences' from the menu and hit on 'iCloud'. Go to 'Manage' now and click 'Backups' from left. Pick out the iOS device from right and click on the one you don't need backup of. At last, hit on 'Delete'. Start with opening iCloud for Windows. Now click on 'Storage'. Look for 'Backups' on the left side and choose one iOS device from the right side. 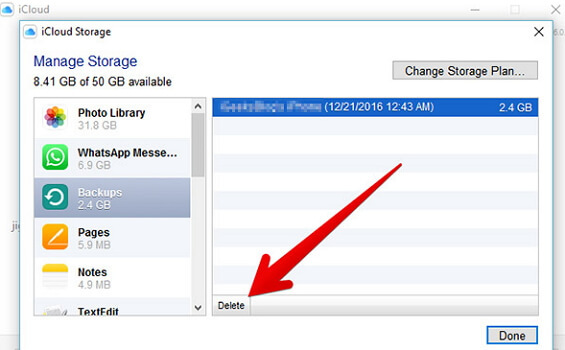 Finally, hit on 'Delete' and your iCloud backup will be deleted. First of all, if you delete your iCloud backup, the data you have backed up to iCloud will be erased. 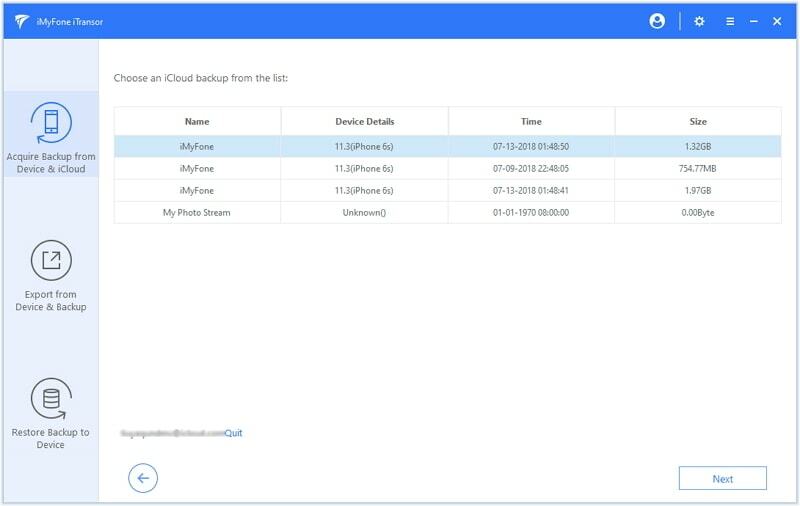 That means you will not be able to recover data from iCloud backup if set up your iPhone from the start or you lose any important data on your iPhone. 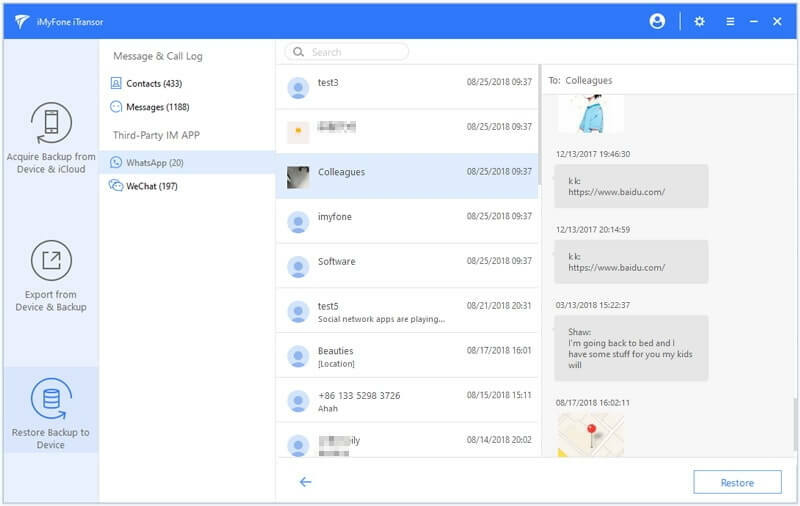 Of course you can use third-party tool such as iMyFone D-Back, to recover data directly from your iPhone, but not everything can be recovered. No recovery tool can guarantee that. Therefore, if you have important data in the backup, do not delete it, you can try to export the data and then delete it. Secondly, when you delete your iCloud backup, the data you synced to iCloud.com or with other iOS devices will not be influenced. Some people worry about the data they have synced to iCloud will be erased. Actually, the data you sync using iCloud and the data you backup to iCloud are different. They will not influence each other. 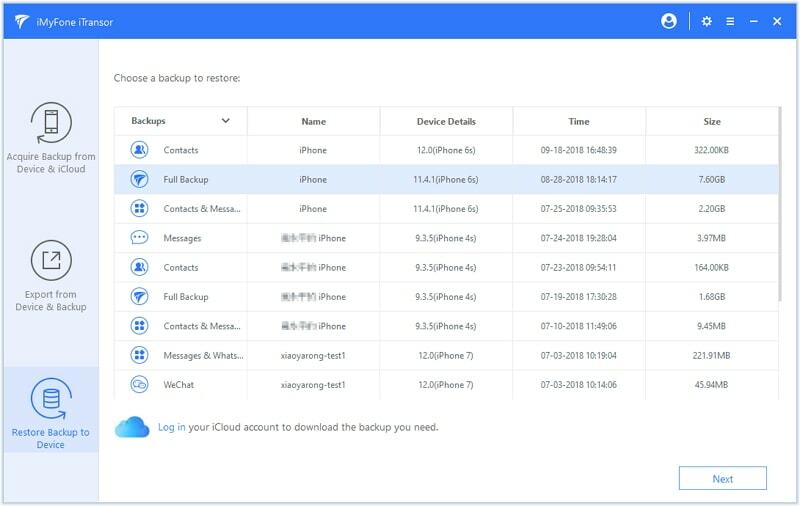 Thirdly, when you delete your iCloud backup, you iCloud storage will be released, but your iPhone storage will not be changed. To save the important data in your iCloud backup before deletion, you can export it using a reliable data exporter tool. 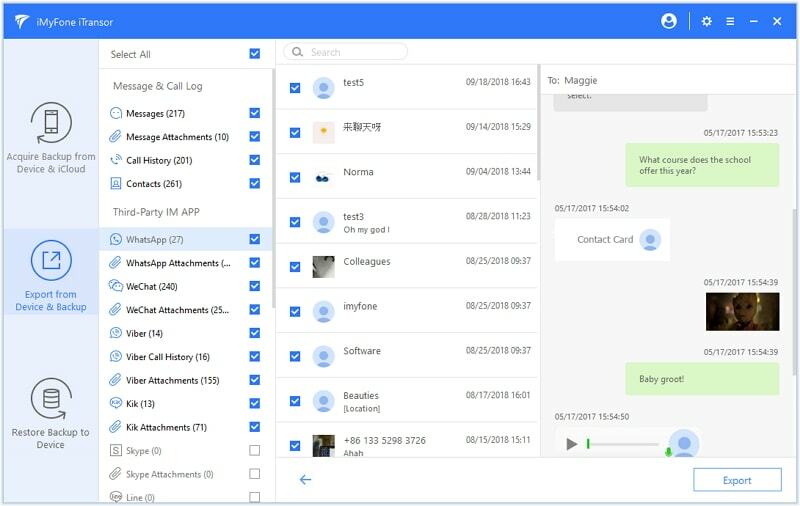 In such case, we recommend you iMyFone iTransor which is an outstanding iOS data exporter and holds the capability to export over 18 data types easily from iCloud/iTunes backup, iPhone/iPad/iPod touch as well. It is complete compatible with the latest iOS version, latest iOS models including iOS 12, iPhone 8, and iPhone X. Let us understand the tutorial to export data from your iCloud backup. Download iMyFone iTransor on your computer and install it then. You need to download iCloud backup from your iCloud account first. Click 'Acquire Backup from Device & iCloud', and then 'Download iCloud Backup'. Enter your iCloud details. Then the program will show all the iCloud backups in your iCloud account. 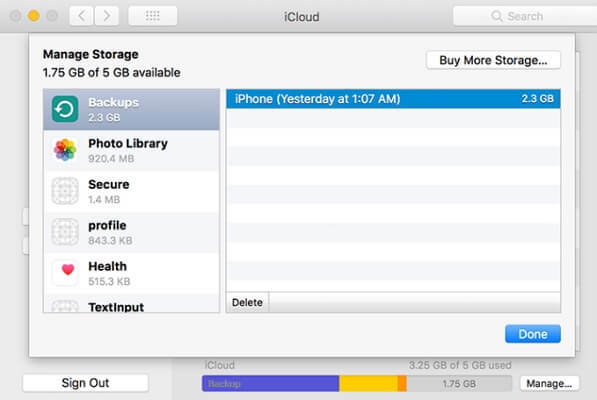 Choose the iCloud backup that you want to delete and save data from, then click 'Next'. You can download all the backups one by one. Click 'Export from Device & Backup' option at the left panel. Choose 'Export From Backup' option. You will see the backup list detected by iMyFone. Choose the iCloud backup that you want to save data from and click 'Next'. Then you will be asked to choose the data types that you want to export. After picking out those you wish to export, click 'Scan'. After the scanning, the program will allow you to preview your data. Choose the items you want and hit on 'Export' at the end. This will get your desired data exported from iCloud backup. 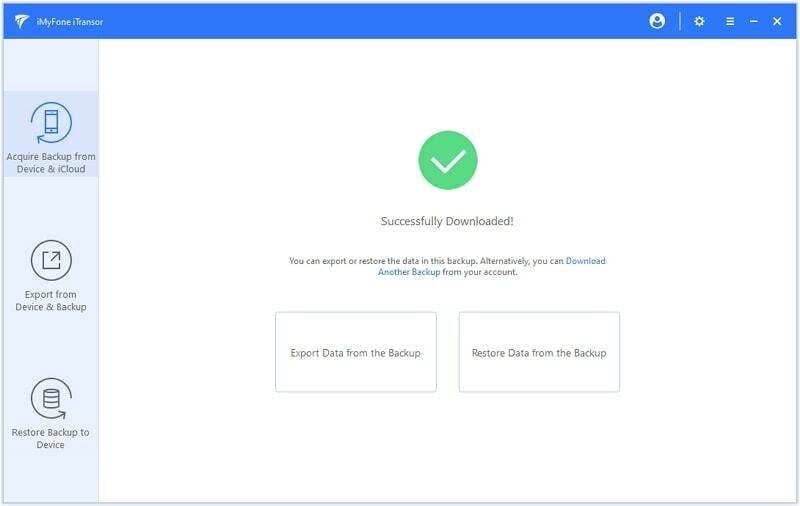 Now you can delete the backup from your iPhone or on your computer. 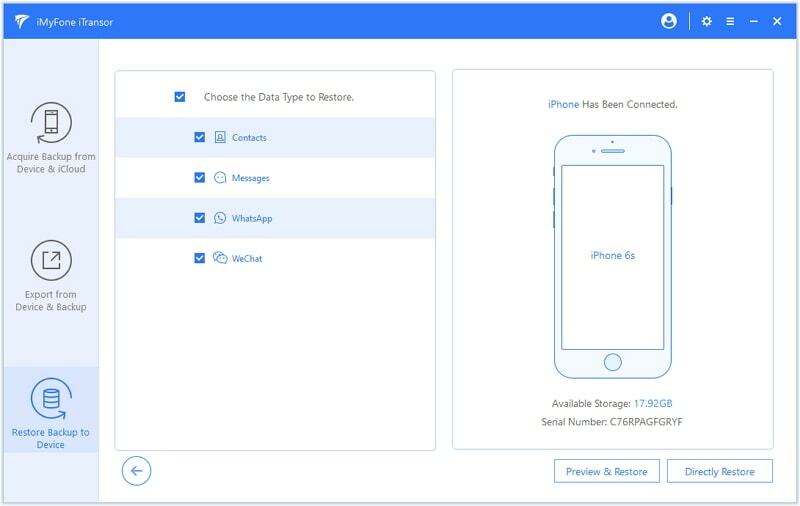 If you wish to restore some data to your iPhone from your iCloud backup and merge the data with the corresponding app data on your iPhone, iMyFone iTransor can help you too. 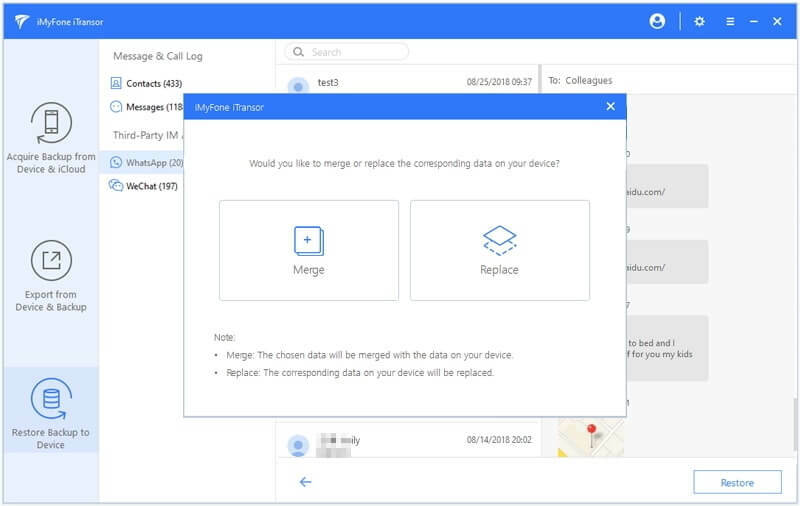 This tool offers its users the flexibility to backup and restore your iOS data fully or selectively. 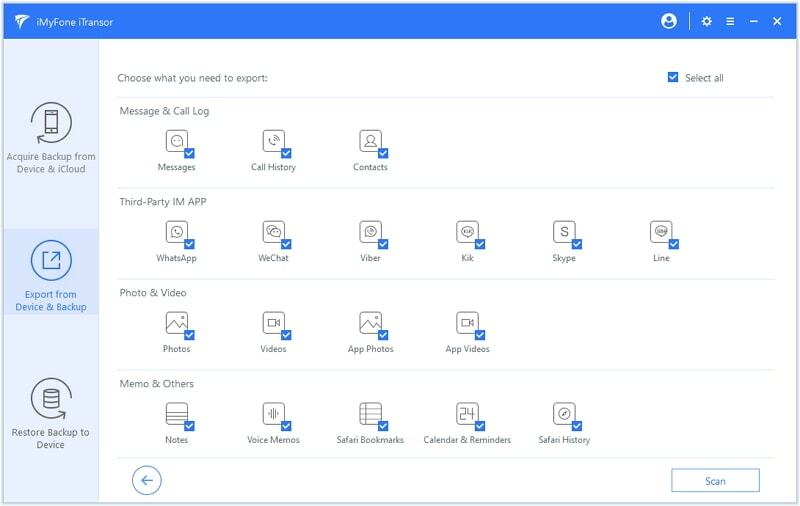 You can backup and restore only WhatsApp, WeChat, Messages, Contacts instead of all the data on your device. You can also simply restore these data types from your iCloud or iTunes backups via this tool and merge the data together. Following is the guide for selectively restoring iPhone from iCloud backup. Step 1 – Start with downloading and installing iMyFone iTransor. Launch it afterwards and from the main screen, choose 'Restore Backup to Device' that is noticeable on the left panel. Now, you will get the list of all the backups you have made. Choose an iCloud backup you have just downloaded from the list. Step 3 – Choose data types you want to restore from your iCloud backup and then connect your iPhone to computer. If you want to preview the data details, click 'Preview & Restore'. Step 4 – When the scanning is finished, you can preview your data before restoring. After when the previewing gets finish, you can click on 'Restore' to finish the process. If you have new data on your iPhone and you don't want to lose the data, choose 'Merge' instead of 'Replace'. 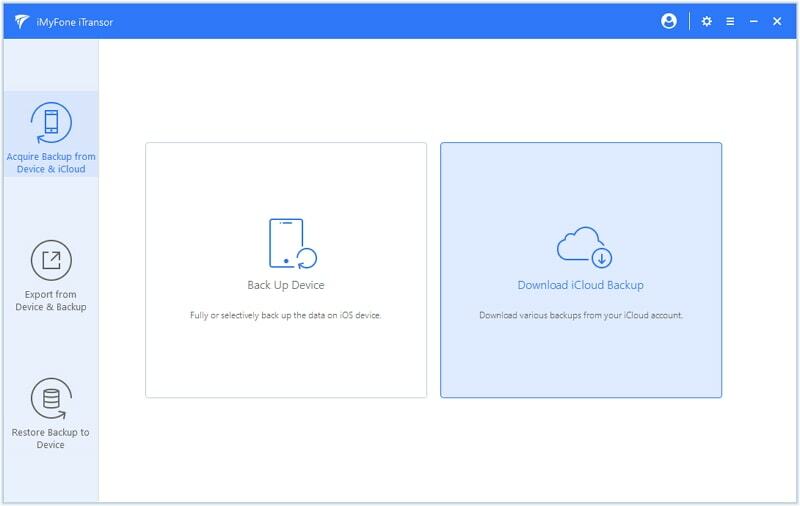 This tool offers free trial version, so you can just download it to view the content in your iCloud backup and have a try.